Normally, I talk about resource books which are devoted to vintage jewelry which is my main interest. However, there is a great book that I have just discoved which is designed for those jewelry artists who want to create sensational, one-of -a-kind contemporary jewelry. 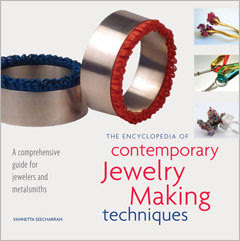 The book is called Encyclopedia of Contemporary Jewelry-Making Techniques, by Vannetta Seecharran, a London designer. It has step by step instructions with photographs for methods which work with a wide range of materials, such as plastics, rubber, resin, ceramics, glass, leather, textiles and much more. Each of the mediums is discussed in great detail and design techniques for all of them are featured. The book is available in paperback and hard cover from bookstores or online at Interweavestore.com. If you make contemporary jewelry using unusual design mediums, this may be a book for you to check out.